Your excavator’s maintenance is probably one of the most critical tasks that should be completed daily. Everything decays with time. That apple you left on the counter over the weekend; that 1993 Lancer you used to have that always trailed a haze of blue smoke wherever it went; those boots that got left in the shed for a year that ended up mummified: everything has a use by date. But if you’d put that apple in the fridge, given that Lancer regular oil changes and given those boots a lick of polish, chances are you would’ve gotten a lot more life out of them. Maintenance is KING! Despite the tough work they’re used for, excavation equipment requires the same level of maintenance as anything else that you want to make last. In fact, given how tough many of the jobs we ask of them are, they can actually require more. Don’t let a robust appearance fool you; keeping your machinery running at its optimum level requires a rigorous inspection and maintenance regime. As unique pieces of equipment, excavators aren’t going to have the same needs as a Toyota Prius or even a fully kitted out Cruiser. A combustion engine does not a car make. Follow these specific steps to make sure your excavators keep on ticking and never let you down on the job. They may not have tire’s, but excavators need to get around like any other and to do so their running gear needs to be kept in good condition. Components in the undercarriage are wear items. What does this mean? In the course of doing their job, these components are going to suffer wear, and will eventually have to be replaced. How long you can go between replacement intervals will depend hugely on how well the undercarriage is maintained. Leaving it caked in mud, rocks, gravel and everything else it may encounter onsite will increase the amount of wear the components suffer and how quickly they’ll give up the ghost. Proper lubrication, ensuring the tracks are properly tensioned and keeping sprocket bolts tightened properly are all important ways to keep an undercarriage rolling. Once these parts wear out they are expensive and time consuming to replace, so extending their lifetime is a win in every respect. The hydraulic system of an excavator is the key to its being able to perform even the most basic of tasks, which is why it’s so important to keep it in peak condition. The thing to realize is that hydraulic fluid, while still oil, is not the same as the oil you put in your engine. Well duh, we can hear you reply, but bear with us. Engine oil is easy to keep track of. You have a dipstick to check the level and at the same you can get a look at the colour and determine how near you think your next oil change might be. Hydraulic fluid is not the same. It’s inherently more hidden and as the old saying goes; out of sight, out of mind. It also shows its wear less readily than engine oil simply because it’s kept in a much cleaner environment, with no controlled explosions going on around it. But just because it might look clean doesn’t mean it’s doing its job as well as it was when it was new. You operator’s manual will tell you exactly when you should be changing your hydraulic fluid and you’d do well to heed the advice. Grease is magic. It keep out moisture, stops friction in its tracks and is generally the difference between premature wear and a long and trouble free life for components. Unfortunately, grease isn’t set and forget. Bearings need repacking, joints need to be frequently inspected and pins and bushing will just about send you bankrupt after greasing them day in and day out. That said, you can also over grease parts, and this can be just as harmful as not using enough. Too much grease will spill out of where it’s needed and make a mess on the surrounds. Apart from being a pain, this will attract sand, dust and gravel, potentially damaging parts. Keep the grease within the confines of where it’s doing its job and leave it at that. Keep your grease gun at the ready, but don’t be afraid to holster it. This is the best way to keep track of your maintenance. With multiple operators, it’s inevitable that relying on word of mouth or just trusting on ‘the other guy’ to do the work will lead to missed services and premature failure. Keep a record, as meticulous as possible, of every bit of servicing, large or small, that you perform on the excavator. Just like with a car, this will also be a nice selling point if you ever decide to part with the machine. Everyone likes to know that the thing they’re buying has been looked after. Simply keeping an eye (and an ear) on the behavior and performance of your equipment will go a long way towards catching potential problems before they become real issues. 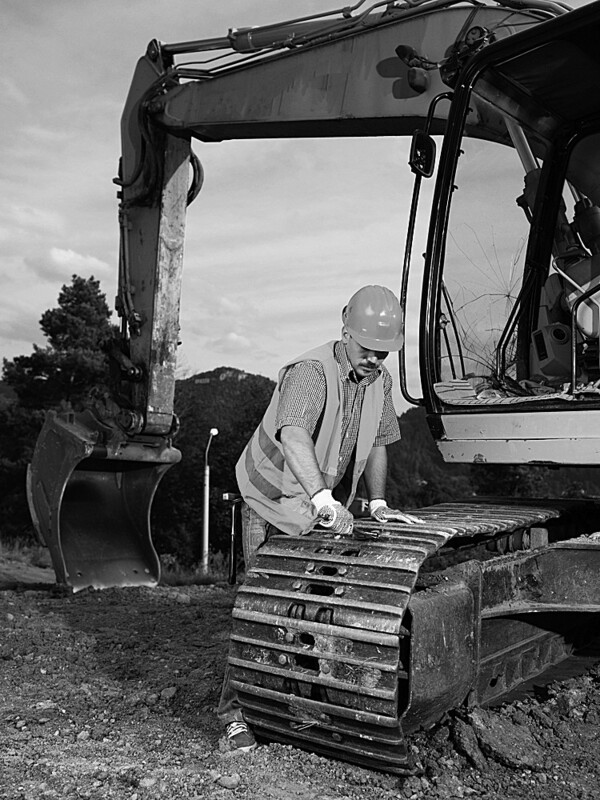 Squeaks, rattles, clunks and crunches can all just be normal sounds that occur in the course of operating a piece of equipment such as an excavator, but if they’re occurring with concerning regularity then it might be time to stop and take a look to see if you can identify any part which might need a bit of TLC. Vigilance combined with a proper maintenance schedule should catch most problems early so they can be nipped in the bud.